Phil Ochs burst onto the American music scene just as the popularity of folk music was breaking through on the national consciousness. Along with friend and rival Bob Dylan, Ochs wrote some of the most compelling topical music of his time. 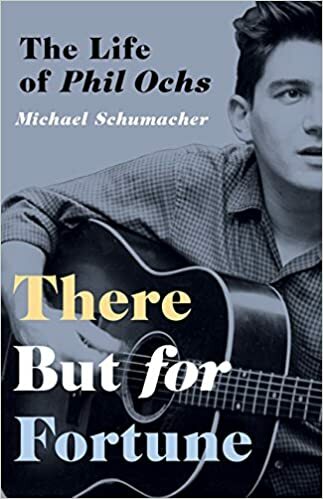 In There But for Fortune, Michael Schumacher explores the life and career of a singer, songwriter, and political activist whose music resonates today as much as it applied to a divided country a half-century ago. His politically charged songs were covered by Pete Seeger; Joan Baez; Gordon Lightfoot; Peter, Paul and Mary; and a host of others, and such songs as “I Ain’t Marching Anymore” and “The War Is Over” became anthems of the anti–Vietnam War movement. He seemed to be performing everywhere, from concerts on college campuses to huge demonstrations, culminating with an appearance at the Democratic National Convention in Chicago in 1968. But as this biography illustrates in painstaking detail, Ochs suffered from a dark side that gravely affected his life and music. Diagnosed as manic depressive, he shifted between incredible highs and debilitating lows that ultimately drove him to suicide at age 36. To piece together his life story, Schumacher interviewed Ochs’s friends, family members, and fellow musicians; examined his journals and scrapbooks; and even scrutinized his FBI files. While Phil Ochs’s life might have been plagued by downturn and tragedies, his music is an enduring call to activism and fighting for a better future.